From left: Keio University's Kentaro Nomura and Kenji Yasuoka stand alongside the University of Nebraska-Lincoln's Xiao Cheng Zeng and Jaeil Bai. 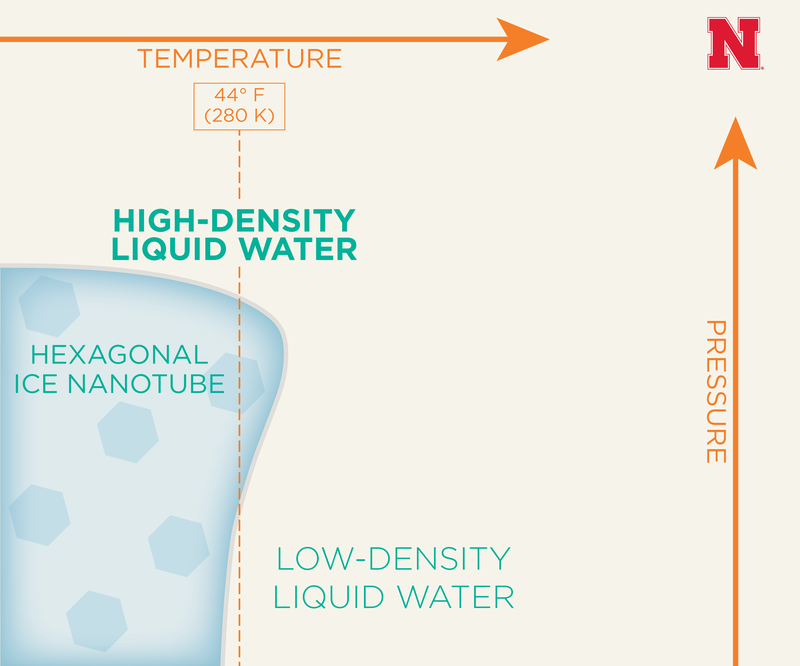 Putting water in a (really) tight spot and cranking up the pressure could reveal new sides of its already mercurial personality, says a new international study co-authored by chemists at the University of Nebraska-Lincoln. In its gaseous state, water takes the form of vapor; as a solid, it can adopt at least 21 forms of ice whose molecular structure varies with the temperature and pressure surrounding it. But its most famous state – the liquid covering two-thirds of Earth’s surface and sustaining all life on it – has remained something of a mystery. Since the early 1990s, researchers have offered evidence both for and against the idea that liquid water can transition into two forms whose density – the number of water molecules present in a given volume – is notably lower or higher than the standard one gram per cubic centimeter. As reported in Proceedings of the National Academy of Sciences, Nebraska chemist Xiao Cheng Zeng and Japanese colleagues have proposed that these low- and high-density forms could emerge from housing liquid water in a carbon tube about 100,000 times thinner than a human hair. The team performed computational simulations suggesting that at a constant 44 degrees Fahrenheit, nanotube-encased water under increasing amounts of extreme pressure will transition to a low-density form before freezing into a hexagonal ice nanotube and then melting into a high-density liquid form. “This has been a Holy Grail, to see whether there are two kinds of liquid water,” said Zeng, Chancellor’s University Professor of chemistry. Yet Zeng admitted that the team was not even seeking the grail – it was simply hoping to determine the temperature at which water froze into an ice nanotube. Previous research arguing for the existence of low- and high-density forms has proposed that they would be found more than 40 degrees below zero Fahrenheit, beyond a “no man’s land” in which even the most purified liquid water begins crystallizing into ice. This fact has greatly complicated the search, Zeng said, by forcing researchers to measure liquid water on the unimaginably short timescales at which it might exist in those forms before freezing. Recent advances in the fabrication of carbon nanotubes – combined with a more forgiving temperature – could make the team’s nano-test tube an appealing alternative among experimentalists looking to confirm the existence of these long-debated forms, he said. “It’s a prediction from a computer simulation, but I would say it has a much better hope of being tested in the laboratory,” Zeng said. Zeng authored the study with Kenji Yasuoka, chair of mechanical engineering at Japan’s Keio University; Joseph Francisco, dean of the College of Arts and Sciences at Nebraska; Jaeil Bai, research assistant professor of chemistry at Nebraska; Kentaro Nomura of Keio; and Toshihiro Kaneko from the Tokyo University of Science. The researchers received support from the National Science Foundation and the University of Nebraska’s Holland Computing Center.